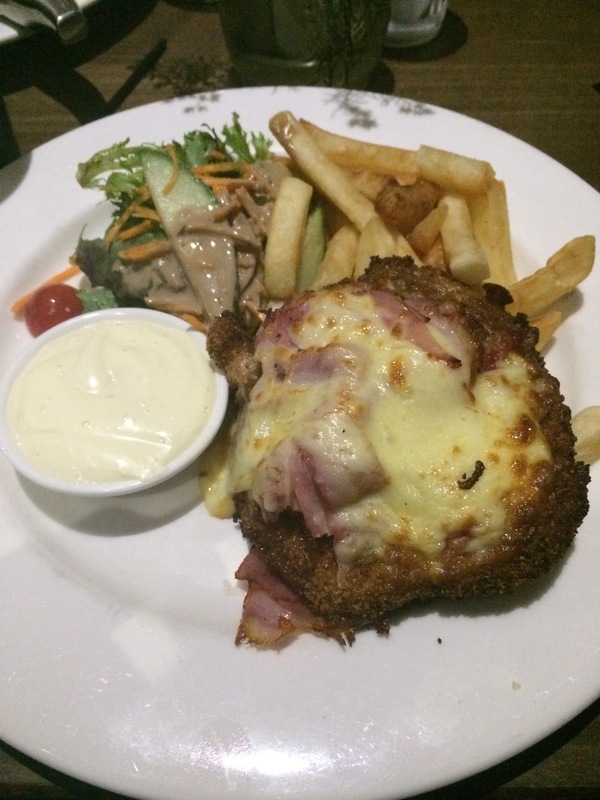 Parma Number 5: The Kenmore Tavern … when three cheeses still aren’t enough! The Verdict: I had high hopes for this Parma given the revamp of the venue of late and the fact that the menu is overt with letting one know: a. this is a classy venue and b. there are a mix of three cheeses on the Parma. Alas a dry chicken breast, more folded ham and side dishes I wouldn’t serve my enemy left me feeling let down by this offering. Chicken Breast: From just the look of it I got the sense that this chicken breast a little bit dry and thank goodness I had ordered a pint of Coke to wash down my meal because I certainly needed it here. Maybe that is why it took 45 minutes for our meals to come out in a virtually empty restaurant? The chicken breast was just overcooked. Tomato Sauce: I really enjoyed the tomato sauce on this Parma. It was rich and flavoursome. You will note from the photo that there was a good covering albeit it did not cover the whole of the upward facing portion of the chicken as I would have liked. Ham: What is it with Chicken Parmigiana purveyors and folding up ham at the moment? At least there was a fair bit of ham to try on this Parma despite it being folded into an origami puzzle and it did taste nice. Cheese: I have already mentioned in the verdict that the menu spruiked three types of cheese on this Parma and the cheese certainly didn’t disappoint. It was spot on flavour wise however, again, there was not an even covering of it which is another bane of my chicken parmigiana experience. Side dishes: I probably could have forgiven the dry chicken breast and the ham origami if not for the side dishes that accompanied my dish. The chips were akin to those chips that you get some times at the fish and chip shop that have been sitting in the hot bay for just a tad too long: some were ultra crispy, some were soft and mushy and some just tasted wrong. The salad was just not good: I can not come up with an analogy … not good is enough for me! Presentation: Again either the plate was too small or the chef enjoys placing food on top of other food. Enough said. The Final Word: If I lived in the Kenmore, Chapel Hill, Indooroopilly corridor the Kenmore would by my local. It has had a new fit out and has a TAB and that is enough for me. It is telling that when we walked out of the venue that I commented that the next time we came back I would like to try something else that caught my eye on the menu. This Parma had it good points (did I mention 3 cheeses?) however the bad points are enough for me to not be rushing back! This entry was posted in Uncategorized and tagged Brisbane, brisbane best, kenmore tavern, Parma. Bookmark the permalink.